Vaccines against diseases such as cholera, plague and smallpox were developed by Russian scientists. Humankind has always had to deal with infectious disease, but it has never been particularly good at treating those illnesses. Until the 19th century, bacteria and viruses were the main cause of death. But the advent of vaccines and immunology has transformed the nature of the problem from mystical and incomprehensible to scientific, and then organizational. The majority of infectious diseases are now curable and/or preventable. Soviet scientists and doctors made a great contribution to this achievement. What, then, are some of the most deadly diseases they managed to defeat, and how did they go about it? Smalllpox is caused by the smallpox virus, which is transmitted between humans through face-to-face contact, contaminated objects, or through the air. Depending on the exact type of the virus, the disease kills 10 percent to 40 percent of its victims; the figure can sometimes be as high as 70 percent. So far, smallpox remains the only infectious disease to have been completely eradicated. Doctors in India knew as far back as the 8th century that smallpox is a once in a lifetime disease; survivors develop total immunity for the rest of their lives. That is how Indians came up with the idea of variolation, a technique whereby healthy people were deliberately infected through contact with those suffering from a mild form of the disease. Nevertheless, such a primitive form of vaccination was dangerous, killing one person in50. In 1796 the famous English physician Edward Jenner inoculated James Phipps, then 8, with cowpox, a non life-threatening disease people can catch from cows. After a certain period, he inoculated his test subject with smallpox, but the boy remained healthy. That was the beginning of the global campaign to eradicate smallpox. The smallpox eradication plan was drawn up by Soviet medics. It was adopted at a general meeting of the World Health Organization (WHO) in 1967, for which the Soviet Union can rightly take credit. The first stage of the anti-smallpox campaign was the most expensive but also the simplest; it boiled down to getting as many people as possible vaccinated. During the second stage, specialists tracked down and treated localized outbreaks of the disease in order to make sure that not a single one of the billions of people living on our planet was infected. The efforts to find every last one of the remaining smallpox sufferers were sometimes compared to searching for needles in a haystack. The last naturally occurring case of smallpox was diagnosed in October 22, 1977, in the town of Merca in southern Somalia. On May 8, 1980, the 33rd session of the WHO officially announced the eradiation of smallpox. Only two laboratories in the whole world—one in Russia and one in the United States—still store samples of the virus. The decision on whether to destroy these last samples has been postponed until later this year. Plague is caused by the bacterium Yersinia pestis. The disease has two main forms: bubonic and pulmonary. It manifests itself through fever and blood poisoning within days of infection. If left untreated, it kills most of its victims. There have been three known plague pandemics: the Plague of Justinian from 551 AD to 580 AD; the Black Death from 1346 to 1353; and a pandemic in the late 19th to early 20th century. The only weapon people had against that terrible disease was quarantine. In the pre-antibiotic era they also treated dwellings with carbolic acid. The first plague vaccine was developed in the late 19th century by Vladimir Khavkin, a scientist from Odessa. Tens of millions of dozes of the vaccine were used all over the world up until the 1940s. Unlike the smallpox vaccine, the vaccine against plague could not totally eradicate the disease, and it reduced mortality by a factor of 10 rather than preventing deaths from the plague altogether. Nevertheless, it was widely used for lack of any better alternatives. Cholera is caused by the bacterium Vibrio cholerae. Transmission occurs by drinking water or eating food contaminated by the feces of an infected person. Before the invention of antibiotics, there was no effective treatment for cholera. But in 1892, Vladimir Khavkin, who had previously developed the plague vaccine, developed another vaccine against cholera in his Paris laboratory by heating up the bacteria that cause the disease. Khavkin tested his vaccine using himself and three friends as test subjects. 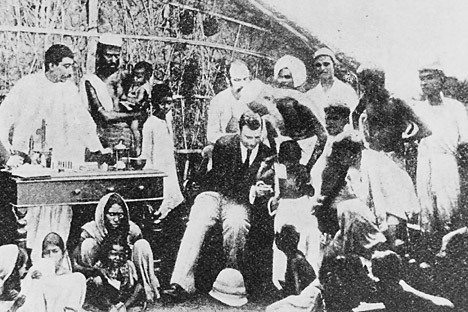 After receiving personal approval from the outstanding French microbiologist Louis Pasteur, Khavkin traveled to India, where in 1895 he reported the vaccination of 42,000 people and a 72 percent reduction in mortality among those vaccinated. There is now an institute in Mumbai named after Khavkin (the Haffkine Institute). A new generation of vaccine based on his method is still being recommended by the WHO as the main weapon against cholera in the affected areas. First published in Russian in Russkyi Reporter.